We used to hear this all the time, about how the iPad was only for consumption. About how it's not a real computer if it doesn't have word or excel. The doubters are mostly silenced now, but many of us still don't use a tablet as our primary computing device. Everyone uses them in the airport and on the couch, but how many people use them at their desk at work? I didn't buy an original iPad. I was skeptical at first about what I would use it for. I read news and used twitter on my iPhone, and I did everything else on my Mac. Where did the iPad fit in for me? That all changed when I got an iPad 2 on launch day. It turned out that I could use it for almost anything. Within a week I was using it extensively for reading, with apps like Instapaper and Reeder. It nearly replaced my Mac for checking email. Its great for checking scores, looking up recipes, and watching movies. I even use it to fly a remote control helicopter around our office at work. I'm even using it to write this article. But where I really started to see its potential to replace my Mac entirely was games. I love playing games on the iPad, to the point where, having been an avid computer gamer for most of my life, I didn't play a desktop computer game for more than a year. I still love my iPad and I use it everyday, but there remain two areas where it has not replaced my Mac: editing photos, and writing software. I shoot sports semi-professionally, and I take a lot of landscape and wildlife pictures. I use Aperture to manage my photo library because of its power to organize, catalog, and quickly select and edit shots from a large shoot. There are many excellent photo editing apps on the iPad, such as iPhoto and Snapseed, but none of them are capable of solving the mass storage problem. I don't expect this to be the situation forever though. The time will soon come when we will have enough storage in the cloud to host hundreds of thousands of RAW photos, and when that day comes I am confident that I will be able to use the iPad for editing photos. Which leaves...writing software. 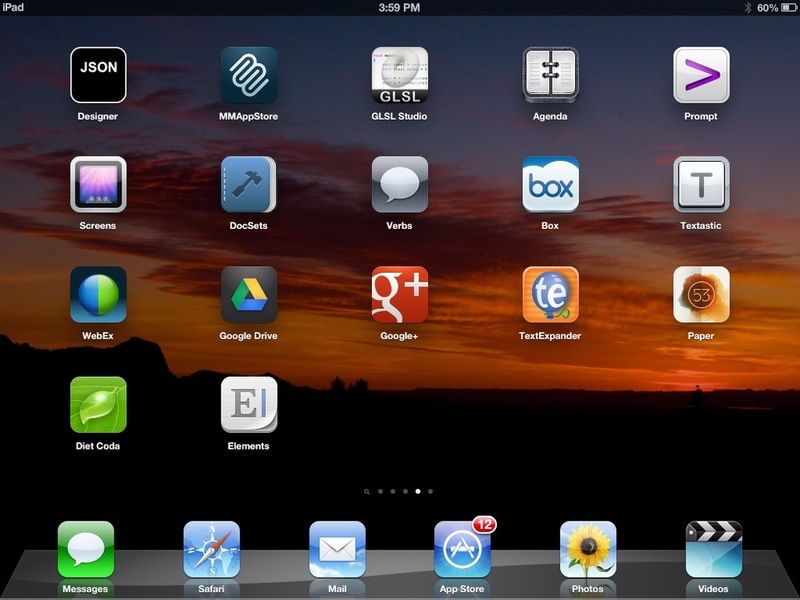 If you think about it, it's really a shame that you can't develop iPad apps on the iPad. It's like a step back to the early days of PC's, when PC's lacked the power and tools for developing software. In many ways, being able to develop software for a computing platform on that platform is a right of passage. You have to think that the iPad will get there eventually too, but we are still a lot further off than we are for other types of content creation, like editing photos, writing, painting, drawing, and making music. The biggest show stopper is the lack of a compiler. Sure you can create and edit source files, but you can't build them without the help of a Mac. You still need a truck for all of the heavy lifting. I'll be writing more about how it goes everyday, but in general I am optimistic. A lot of the apps I have been trying out for this experiment are truly amazing. That gives me tremendous confidence in the future of the iPad platform. Which leads me to my hypothesis for this brief experiment. I expect that there will be snags, but that I will be able to do all of my work on the iPad this week while my Mac remains at home. I also expect that while the day where the iPad will completely replace my Mac isn't here yet, that its not as far off as It may seem now.